Karine Deshayes as Angelina (Cinderella) in “La Cenerentola”. Photo Credit: Cory Weaver. (“La Cenerentola (Cinderella)” plays at the War Memorial Opera House November 18, 21st and 26th, 2014). 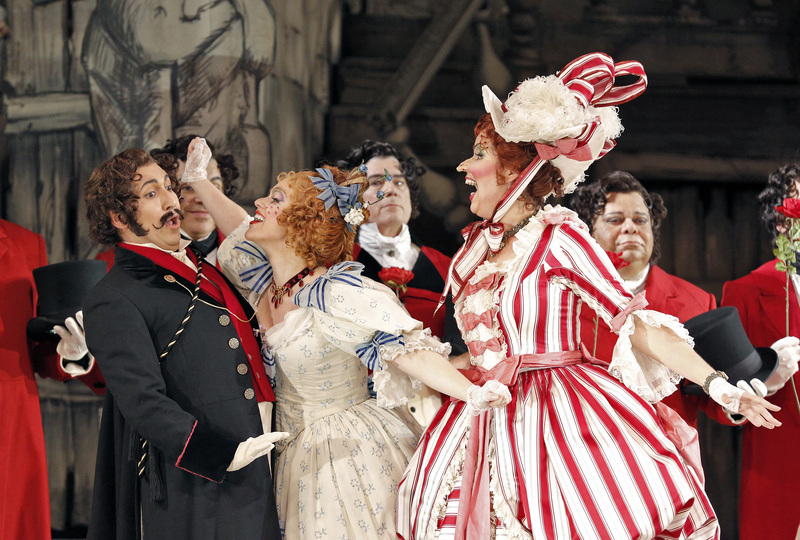 “La Cenerentola (Cinderella)” by Gioachino Rossini, currently in production at San Francisco Opera is a wonder in every respect from the set design to the colorful voices of the singers. The story of “La Cenerentola” is a retelling of the classic folk tale we know as Cincerella. While most Americans have come to know this story through Walt Disney’s animated masterpiece, the opera is rich in additional detail, much of which differs from more familiar tellings. For instance, Angelina, the central figure, is kept in poverty and servitude by an evil stepfather, the Duke of a decrepit palace. Instead of a fairy godmother transforming the heroine into a princess, it is a spectral figure, a blind beggar who has received her kindness, that magically intercedes for the unfortunate girl. The beggar might be an incarnation of her dead father. The Prince meets Angelina while disguised as his own valet and falls in love with her pure heart, kindness and beauty. Of course there is a ball! And a hunt for the mysterious beauty who departs suddenly, leaving the prince with a bracelet and a challenge to “find the girl who wears its companion”. 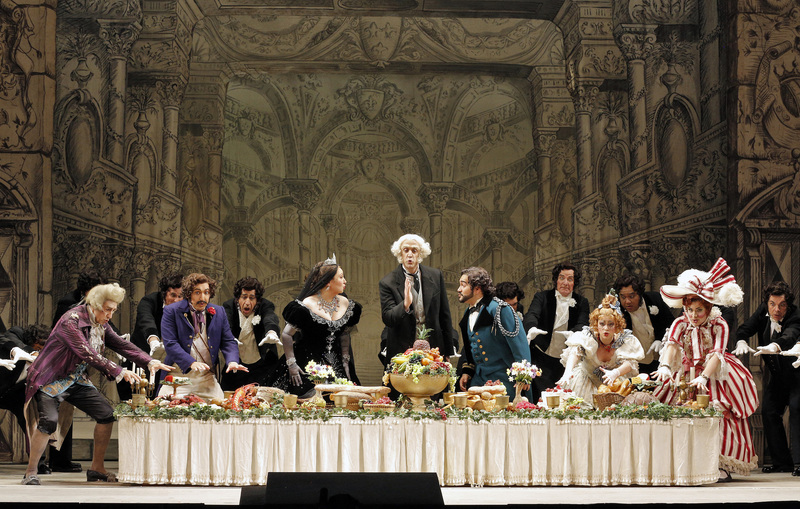 The Dinner Party from Act I of “La Cenerentola”. Photo Credit: Cory Weaver. The opera was first performed in 1817, a year after Rossini’s great success with “The Barber of Seville”. Although “La Cenerentola” premiered in New York City in 1826, it was not produced in San Francisco until 1969, at which time the present production was created by the famed designer and director, Jean-Pierre Ponnelle. The production was duplicated in Europe and has defined the opera for the last 45 years at houses throughout the world, remaining timeless and as perfect a treatment for this story as is imaginable. The black and white hand drawn sets, completely refurbished in 1991, seem to be lifted from the pages of a storybook and provide a simple yet memorable backdrop for the colorful costumes and humor of the story. The current production is directed by Gregory Fortner and ably conducted by Jesus Lopez-Cobos, returning to the San Francisco Opera after an absence of 40 years. This is a performance of shining musicality, splendidly cast to take full advantage of Rossini’s florid melodies. 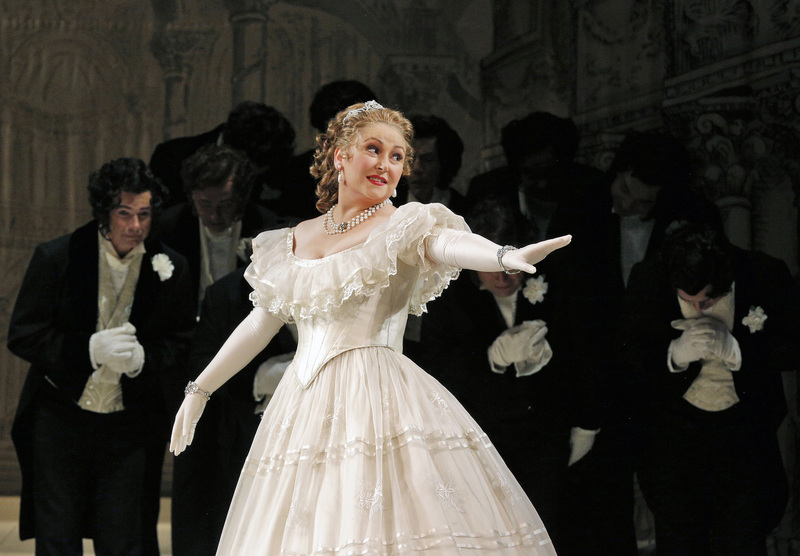 Singing the role of La Cenerentola is French mezzo soprano, Karine Deshayes, making her San Francisco Opera debut. Her performance is engaging and lively, her voice lustrous and colorful with ease and buoyancy throughout the evening. She is well paired with tenor René Barbera as Prince Don Ramiro, also making his company debut. Barbera’s voice is free and even in its mastery of the intricate coloratura aria blooming in complete control with thrilling high notes. Carlos Chausson contributes a rich, full baritone to the role of Don Magnifico, Angelina’s manipulative stepfather. It’s clear from his command of the role that he is a master of the comedic buffo repertoire. Adler Fellows Efraín Solís as Dandini, Maria Valdes as Clorinda and Zanda Švēde as Tisbe. Photo Credit: Cory Weaver. Adler fellows Efraín Solís, Maria Valdes and Zanda Švēde play the roles of Dandini, the prince’s valet and Angelina’s two haughty stepsisters. Solís in particular stands out for his full, pleasing voice and engaging acting. Christian Van Horn, bass baritone, adds intrigue as Alidoro, alternately commenting on plot developments and bringing Angelina’s dream of attending the Prince’s ball to life. The opera is very much an ensemble piece with numerous duets, trios and quartets matching the artists with one another, showcasing their vocal talents in an endless variety of Rossini’s delightful devices. An unexpected highlight of the evening was the rich sound of the men of the SF Opera chorous. They were particularly adept and well used in this production. “La Cenerentola” is at once a worldly tale of greed and cruelty turning on their master, a reminder of the roles of women in the world of feudal Italy, and a lighthearted fairy tale that indulges our very human wish for a happy ending. This production is highly recommended: it will take you back to childhood and show you a bedtime story all grown up. “La Cenerentola”, by Gioachino Rossini, libretto by Jacopo Ferretti. Conductor: Jesus Lopez-Cobos. Director: Gregory Fortner. Production Designer: Jean-Pierre Ponnelle. Lighting Director: Gary Marder. Chorus Director: Ian Robertson. Angelina (Cenerentola): Karine Deshayes. Clorinda: Maria Valdes. Tisbe: Zanda Švēde. Alidoro: Christian Van Horn. Don Magnifico: Carlos Chausson. Don Ramiro: René Barbera. Dandini: Efraín Solís. Please like us on Facebook and subscribe by clicking as indicated at the upper right corner of this page. Thank you! Posted in Reviews.Tagged Carlos Chausson, Charles Kruger, Christian V, Cinderella, Daryl Henline, Efrain Solis, Gregory Fortner, Ian Robertson, Jesus Lopez-Cobos, Karine Deshayes, La Cenerentola, Maria Valdes, René Barbera, Rossini, San Francisco Opera, San Francisco Opera Reviews, San Francisco Theatre Reviews, theatrestorm, Zanda Svede.